After the Belfast Marathon 2010. Two down, one to go in my triple marathon challenge! I have completed seven marathons and nine half marathons and numerous other race distances since 2010. Not really built for long distance running I am immensely proud of my 3:35 marathon personal best. I have bad hip arthritis now and have just done one marathon since 2012 (now Oct 2015) and I’m finishing my marathons at that ! I will however, continue to run for as long as physically possible. 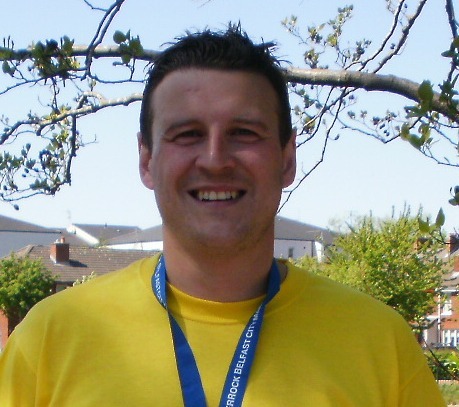 I first started running in 2010 when I decided to take on the Belfast Marathon to raise money for the National Society for Prevention of Cruelty to Children. Believe me, I was no runner! Once I did one marathon I thought I could improve and decided to do the Dublin Marathon six months later. I did this to help raise funds for my children’s primary school. When my aunt died in 2010 of Pancreatic Cancer I learned a lot about this killer disease and the lack of knowledge and money for research. So I set my most ambitious target – three marathons in five weeks in 2011. There is a 3% chance of surviving pancreatic cancer beyond five years and thus the three in five! I ran London, Belfast & Edinburgh marathons and raised £3600 in the process. A year later in May 2012 I achieved my PB in my home marathon of Belfast and my next (seventh and final) marathon didn’t come until October 2015, owing to an operation on the hip. Since 2010 I have just kept running and I have done a series of 10ks, half marathons and marathons (all logged on my ‘race list’ page). 3 Responses to What’s it all about? Nice to come across a blog like yours. Very inspiring. Thank you! A fantastic cause and good luck with the running!! Thanks Seana – I’ll need all the luck I can get by the time the third marathon comes around!